The 2017 edition of the Gartner Magic Quadrant for Disaster Recovery as a Service (DRaaS) was just released and CloudHPT was positioned in the “Visionary” quadrant. CloudHPT is he Cloud Solution division of BIOS Middle East (www.biosme.com). CloudHPT is the only Middle Eastern company to named in report. Gartner named only twenty four companies in their Magic Quadrant report for Disaster Recovery as a Service. Companies were evaluated based their ability to execute and their completeness of vision. If you want to understand more about how Gartner evaluated the vendor landscape and how DRaaS is evolving, download a copy of the report today. It could help you ease and streamline your choice of a DRaaS partner in the Middle East. 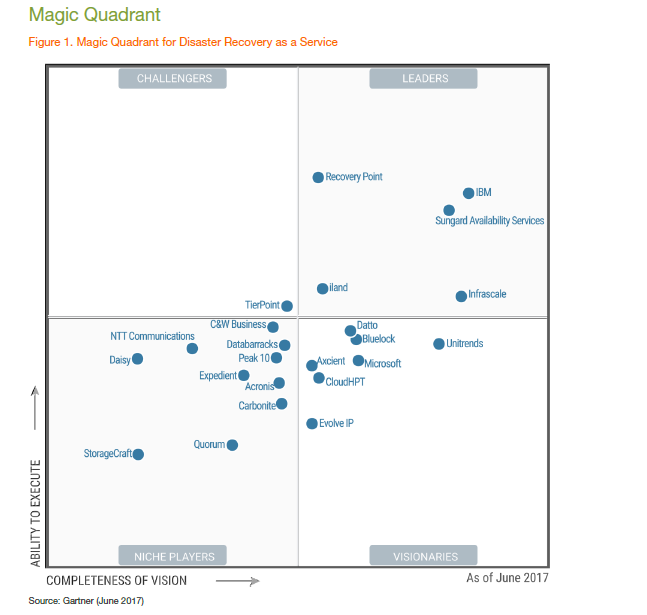 Gartner Magic Quadrant for Disaster Recovery as a Service by, Ron Blair, June 19, 2017. This graphic was published by Gartner, Inc. as part of a larger research document and should be evaluated in the context of the entire document. The Gartner document is available upon request by filling out the form on this page.